What a beautiful thought but is it a reality? Well from what I have observed through the years especially with our seniors, it sure is!! Now what’s that I hear some saying? “We squabble a lot!” “She’s too picky!” “His idea of a good time is laying on the couch, remote in hand and channel surfing between four…count them 4 football games on at the same time.” And where does he want me? Right there rooting beside him! Most of the senior couples I’ve talked with didn’t even have a clue as to what ‘Irreconcilable Differences’ were during their years together. They said that they stuck it out, through good times and difficult times, through the squabbles and the down right foot stomping arguments. How did they do that? How does any couple do that and cross the finish line with 50, 60, 70 years together under their belts? From what I see, they commit to loving one another through it all. They laugh together, they cry together, they hold each other even closer during times of great stress and when it’s all said and done, they take the gold!! Are there really couples like that out there? Yes indeed and I have met them in my years of nursing. In my mind, I am thinking about a certain couple. I can’t help but giggle as I imagine them walking down the street conversing or should I say, major squabbling with one another. Back and forth they go, complaining about this and complaining about that! And then, at the end of their story, I find myself nodding my head and saying, “Cool” when I see them standing together looking out over the lake, and as they look into each other’s eyes and gently as they put their arms around one another, she lays her head upon his shoulder and they cuddle, remembering how much they love one another! Now not all couples go through life having major squabbles like that but even those who do seem to really love one another, even through the complaints. Just in the time I have been with Care4You, I’ve had the absolute pleasure of meeting senior couples who not only showed ‘Forever Love’ to one another when I first meet them but that love was sustained the whole time I was ever in their presence. They walked the talk and what a beautiful example they were and are! Did they disagree? Certainly! Did they roll their eyes when one said something that made the other one scoff? Sure!! But there was never a time when either one showed the other any disrespect and as caregivers, once our clients become very comfortable with us being there, true colors come shining through and I can honestly say that it’s so refreshing to see couples being themselves….laughing, fussing, discussing the children, just normal home life. To me, it’s an encouraging sight and I take a deep breath and close my eyes and remember one beautiful evening, when caregiving for my parents was done for the moment and I walked into our living room to see my husband, yes, channel surfing the television. As I sat there mesmerized not only with her gorgeous voice, the words, oh those words just filled my soul! Oh my…he took my breath away!! I never had anyone in my life declare a song for me and mean it with such love!! And then within a very short time from that joyful moment, my dear sweet husband’s own breath was suddenly taken away one evening when massive blood clots filled his lungs and as I held him in my arms trying my best to help him while waiting for rescue to arrive, my very best friend in this world was gone. Did we squabble through the years…oh yes! Did we have deep personal talks about everything from the meaning of life, the news in the world, our families, our faith, our caregiving? You betcha!! We had our ups and our downs, our laughter and our tears, we celebrated weddings of friends and family, we suffered in the losses of those we loved and all in all, even in the most difficult times….leaving each other was never on our minds. We had dreams going into our marriage and while sometimes that road we were on took a surprise turn and those dreams were not met, new ones took over and we forged ahead. And every time I hear Celine Dion sing that beautiful song, ‘Because You Loved Me,’ my heart just swells with the knowledge that we might not have made the golden 50 together…gee, we didn’t even make 30 years together but like so many of those before us and those after us, we were truly in love! Do you have a pet? Maybe a dog, a cat, a parakeet or maybe even a rabbit? 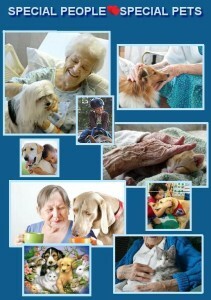 Many people do and many have fond memories of growing up with a favorite pet. I know I do and I remember her with a smile and definitely a giggle or two! She was my beautiful Irish Setter and we called her Brandy. I recall the day that I went with my parents to choose that special puppy from a litter of at least 8. I was told to pick the most active one and was given all kinds of instructions from friends and family on what I should look for in a dog. I had it all memorized until I walked into the barn on this beautiful multi-acre estate in Bluebell, Pennsylvania. I looked at all those cute little puppies, seven weeks old and they were romping all over the place. There she was…this sweet little Irish Setter, walking around the others with such a calm demeanor. She looked over at me and then strolled over to the corner of the barn, laid down, crossed her paws, let out a big yawn as if she was bored with all of the actions of her brothers and sisters and down she went, resting her little head on her legs. Pointing at her, I immediately said to my Mom and Dad, “She’s the one! !” “Are you sure,” they asked? Oh yes, I was sure. I could relate to this little ‘loner’ puppy! And so we brought Brandy home and she became a member of our family for 15 memorable years! The times that we spent together was a mixture of joy, laughter, of learning and yes, of tears as we one day had to say goodbye to this trusted friend. She taught me so much and I wouldn’t trade those times for anything anyone has to offer in this world. One of the biggest benefits that I have seen regarding pets is how our oldest and our youngest citizens relate to them and vice versa. It’s amazing to watch!! It’s heartwarming when a beloved pet comes to visit or to stay with the most vulnerable. What a beautiful connection and one when made, will never be forgotten. Some dear souls who are alone and have no hand to hold and no one to hug, find by just stroking the fur of their favorite pet brings a special feeling between them. A delightful joy, a wonderful calm, an incredible peace and an amazing move in the healing process, according to some. To our seniors and those special little ones for whom we at Care4You are helping….to the families, friends and neighbors who surround those we care for with love and concern and in honor of all those wonderful pets who embrace the hearts of our elderly and the children we serve, I share with you below, two very touching moments in time. 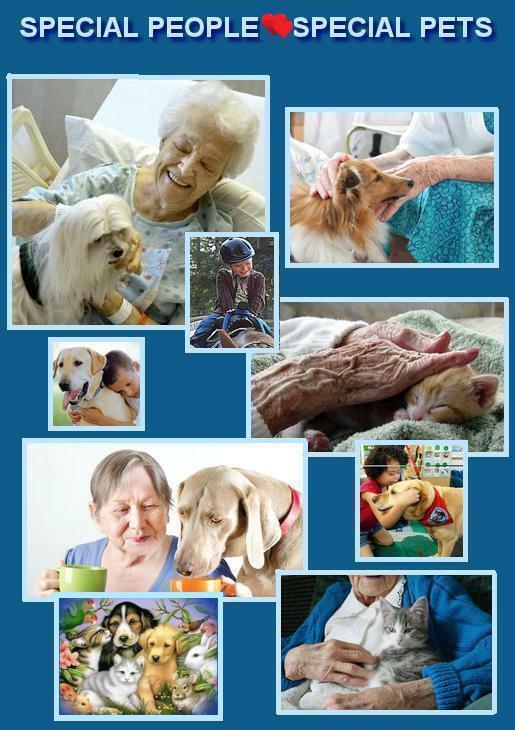 I believe that pets definitely make a difference in the lives of all of us and especially in the lives of our elderly and our children. So ‘BIG HUGS’ to all of our pets who help to fill our days on this earth with such wonderful blessings and help to make those moments in time seem so much easier to bear! Sometimes when I am out and about, especially in restaurants, I find myself observing our seniors and I wonder what life was like for them throughout their many years on this earth. I was having supper the other night at one of my favorite restaurants where many of their patrons are elderly. I love to ‘people watch’ anyway but as I sat there eating my salad, I saw a couple come in that dine there often. She walks with a cane and sometimes a walker. The need for either one was due to hip surgery she had several months ago. He walks slowly, bent over and in my humble opinion he could also use a walker or at least, a cane. But he strides on behind her, keeping a watchful eye on his beloved. He sometimes stops and waits and then walks on. When they come into the restaurant, they find their table, usually a booth. She sits down first and like clockwork, he takes her walker, folds it up and places it against the wall near them. While he does this, he is forever considerate of others as he sees to it that the walker is out of the way of other patrons and staff. He sits down at the end of the booth and she slides herself near him. They eat well. An appetizer first, followed by a full plate of good home cooked food and then always dessert! I smile at the visual. You gotta love those two! I know that I do. I know them by name and they always wave when they arrive and they sometimes come over at the end of their meal to talk with me. But all I know about them is the here and now, so I wonder…. I marvel at the fact that they are out and about, even with their infirmities and their obviously painful struggles just to walk. And I can’t help but admire them and very much respect them for their drive, their togetherness and their love for one another. And then last night when I again was having supper at this same restaurant, I noticed another couple who frequents this place. He is in a wheelchair and she is his devoted wife who helps him if he needs her but allows him to do as much as he can himself. She sometimes looks very tired. Caregivers know that feeling and can easily identify that look in another active caregiver. I watched them as I ate and saw her smile as he looked up at her while she tipped his glass of water towards his lips. He looked back down at his food as he tried to place a piece of his meat on his fork and bring it to his mouth. She sat back in her chair and sighed but immediately regrouped as she leaned forward to once more give him another sip of water. He glanced around the room with staring eyes that sometimes appeared distant and again I wondered. What were their lives like over the years? What all have they been through? The good, the not so easy and the very heartbreaks that many of us have gone through at one time or another. I have often talked with them, acknowledging their presence when they come in or are already seated when I arrive. She smiles and waves. He looks over and smiles as he wiggles his fingers to say hello. He seems like a gentleman who enjoys having fun. At Christmas when we were both there at the same time, he had a Santa hat on and I couldn’t help but watch him giggle at all the attention he received from the rest of the patrons in this restaurant. And when they are finished eating, his wife meticulously gathers her bag of ‘helps’ that all caregivers carry with them, she pays the bill and then she wheels him out to their van. I was leaving also and when I went out to my car, and as I sat there ready to assist, I watched to see how she got him into the van. She pulled open the door, pulled out the ramp and up he went into the van. She turned him towards the passenger area and secured him in. She had it down! She was organized! And so the reason for this video, ‘Crabby Old Woman,’ is that it’s a wonderful reminder to me and maybe to all of us, that our beautiful elderly, who at times may appear distant, even angry or sad…could be looking back and remembering all of those joyful moments in their lives, those dreams of new beginnings and the laughter they experienced with those they loved and realizing that those days are gone and the ones who are caring for them now have no real clue who they are, how they lived and what they have been through. Even though the words to this poem often is seen as written by ‘Anonymous,’ it was supposedly penned in 1966 by a woman named Phyllis McCormack and according to her son, she was a nurse working in a hospital. The poem is written to express the words of an old woman in a nursing home who is reflecting upon her life. Sometimes the word, ‘Crabbit’ is used with this poem and the word is supposed to be “Scots” for ‘bad tempered’ or grumpy. What were their lives like throughout their years here on this earth and as we go about the day to day tasks of helping them in their need, what are they thinking? As I ponder these questions in my mind, I find my heart softening even more, and just getting that ‘visual’ of who they are and what they have been through helps me to be a better person and more importantly to our clients here at Care4You, an even better caregiver. Day after day Care4You caregivers are spending precious hours with our clients, helping in whatever way is needed. We are walking through their world, a world that is on most occasions, very familiar to them. And sometimes our dear clients who are walking their roads with dementia….for them, this world may not be that familiar. 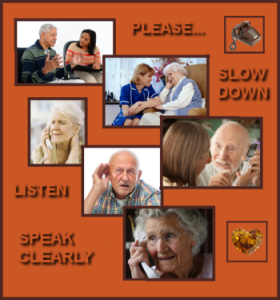 Never the less they need our continued respect with decisions that they may make when we as caregivers may not fully understand, at that particular time. Example….Mom wants to go outside. She wants to leave the house she is in. The reason? She just wants to go out….period! But it’s evening and it’s dark outside. You offer her that simple explanation but she doesn’t believe it. She continues to tell you that she is leaving and gets up and moves towards the door. As she goes to open the door you gently remind her again that it’s dark outside and instead of restraining her, you are there beside her. She finally sees for herself that it truly is dark, so she shuts the door and heads back to her chair. In her world she wanted to do something her way and yet instead of arguing with her that her decision is not the best one, this was a moment when you could let her see that this wasn’t the way to go, all the while keeping her safe as you stood beside her. Another example…you find your Dad standing outside his home and staring towards the street. You ask him where he is going. He looks at you and tells you he is going home but he can’t find out where it is. He is unsure and scared. You tell him he ‘is’ home but he doesn’t recognize anything in front of him. You don’t argue. You tell him that you will lead him home and then gently take him by the hand and slowly turn him around towards his front door where as he looks ahead recognizing his abode he exclaims, “Oh there it is” and with assistance from you, he walks up to his door and goes inside, very much at peace knowing that he truly is back home. No arguments….no getting into a match of wits as to who is right and who is wrong. He is respected at an incredibly vulnerable moment in his life. He now is familiar with where he is. And those with dementia, along with all of us who are their caregivers and loved ones, are living in that moment together….their moment. A moment that may not happen again, at least for a while or may immediately be revealed in another attempt as before. It may even be in a question that they will ask over and over again, the same question where our answers aren’t understood by those we are caring for. Yes indeed, it’s their world and we are passing through it with them. A time that Care4You recognizes can be so frustrating for our clients and very difficult for those who love them. The work involved with our clients can also be everything from companionship to keeping their homes neat and clean. We help with hands on personal care such as bathing and dressing or preparing good meals where sometimes assistance is needed with eating, just to name a few. All in an effort to do our best in every way possible for each and every one of them, when their care is entrusted to us. As caregivers we realize that this world we are coming into with each visit, is not our world per say. It is their world and we enter it with respect, compassion and understanding. For those clients who want to remain as independent in their homes for as long as possible, we absolutely applaud them in their efforts. They make that effort at their own pace, their own speed and in their own way. For those endeavors that are safe to accomplish as we evaluate each step of the way in which we walk with them, we become their cheerleaders. And for those times when we may need to offer a suggestion or two, we try to do it with an understanding of the feelings of our clients in a way that shows respect for them and if safety is not an issue, we then give them the final say. “Everyone here considers it the ultimate privilege to care for someone at a time when they are most vulnerable. After all, this is their world! And while we are there with our clients, we are faithfully walking alongside them every step of the way and yes indeed, we truly are deeply honored! Were you ever a family member, a friend or a neighbor of someone being cared for? Have you wondered how you can be of support to not only that special person needing care but also to the one who is the giver of that care? There are so many ways that people can help. When I was caring for my parents, I had the support of all three…family, friends and neighbors. My family was there for us, not only in their prayers and phone calls but also in their presence. They helped me with the hands on care of Mom and Dad in between their own family needs and their own busy schedules. They worked within our home in areas that needed attention and at a time that couldn’t be a priority for me, as my focus was mainly on my parents. My family’s presence was incredibly valuable! Our friends and neighbors kept in touch with phone calls, asking for updates and offering words of encouragement, all helping us to feel that continued connection with them. Neighbors would plow our driveways and sidewalk during every snowstorm. With only a simple phone call, I would give our local supermarket a list of needed groceries in which they would then deliver when it got to the point in my caregiving that I just couldn’t leave our home to shop. Most of my parents medications were ordered on our computer and then delivered by mail order and that was a very big help! Neighbors helping neighbors! I think one of the most important things that everyone can do when a caregiver is brought in, is for all of us to stay active in the life of the person needing care. I realize how busy lives can be yet we all want our loved one to feel that support and not to feel a loss of connection with family, friends and neighbors. We know that there is great comfort for everyone when there is a caregiver spending time with their loved one. And it seems to be of great comfort to our loved ones to have everyone stay connected through this vulnerable time in their lives. We in turn, recognize that communication goes both ways and we try to encourage our clients to stay in touch with their families, friends and neighbors, too. So what can we all do to help when there’s a need in a loved one’s life and how can we all stay connected? With respect and permission…how about mowing lawns, trimming bushes and trees, shopping for food. Before you throw out your newspapers in the recycle bin, how about sharing it with your neighbor? Offer to drive both the caregiver and their client to an important appointment, especially if parking is at a premium. Find out their food ‘likes’ and if permitted diet wise, make a casserole or a special dessert. Snow plow their driveway and sidewalks when needed. Give them your phone number in case there is an need for assistance when the caregiver isn’t there. Send letters through snail mail or email. Remember birthdays and anniversaries. Are you going to Walmart, Target, Kmart?? How about calling and asking if you could pick up anything that they may need? As close or as far apart as we all are, Care4You feels that we are connected as caregivers, families, friends and neighbors who truly desire to be there for your loved ones. You just might help someone out there…somewhere. This is a story that just touches my heart when it comes to the love and respect that Care4You feels we all need to extend to the elderly in our lives. Personally this video may bring tears to my eyes but it also makes me smile at the heart of a child’s innocent and wise observation. We so cherish families from the very young to the very old who surround each other in adoration and appreciation, in loyalty and steadfastness, because we feel that so much is gained in that loving contact between the family as a whole. Whether in our homes, in our places of worship or anywhere that connection is needed, we are reminded through this one video that the precious and amazing gifts all of us receive from our seniors, the history that they have lived through and the wise and memorable advice that they can pass down to all of us, are just too valuable to miss out on and too important to deny them of sharing. The message here seems so clear.This journey that we are all walking together? We need our seniors and they need us. There is so much that they have to give…to us as adults and to the children, grands and great grands alike and never do we ever want our older loved ones to feel invisible in a world where it sometimes gets too busy to even think straight. And what can we give them? Our love and respect, our attention, our patience when they can’t move as fast or as steadily, or talk and think as quickly as they once did. And as this video shows, the children in our lives are watching and they’re listening to how we treat our seniors and how will they respond? I think of those same children who will grow up and when it’s our time and we are the ones who are elderly, maybe they will be caring for us, maybe they will be voting in legislation that pertains to us and to the quality of our care and will we feel safe and will we feel loved? We applaud everyone who reaches out with kindness to all the beautiful ‘Golden-Agers’ who are in our lives right now. And to those who treat them like we all want to be treated, especially when life can sometimes get a little too difficult for them…Care4You personally thanks you!! I call this kind of story, “Videos from the Heart” and I hope this touches your heart as much as it did mine. We can never forget those dear senior souls who are here right now and who deserve to receive all the love and respect that we can give to them. Helping them to feel very much a part of our families will allow them to know that no matter what happens, we will be there for them….forever and a day. Through the years, my most challenging and rewarding times were in the caregiving of my parents. I can honestly speak here from a daughter’s heart and in my experience I can also speak from a caregiver’s heart. This is what I intend to do in ‘Lilacs & Greensleeves’ as I try my best to represent Care4You and Donna Hoover in sharing thoughts and concerns regarding the caregiving of our loved ones. I will speak from the heart of a daughter and a caregiver. Many of you reading this have been, are, or will be one or the other. You’re a husband, a wife, a mom, a dad, a son, a daughter, a close relative, a good friend, a cherished neighbor! 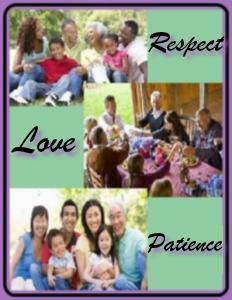 We all can see that caregiving touches many people on many different levels! My mother loved Lilacs, so my dear Dad planted Lilac bushes around their home for her to enjoy. 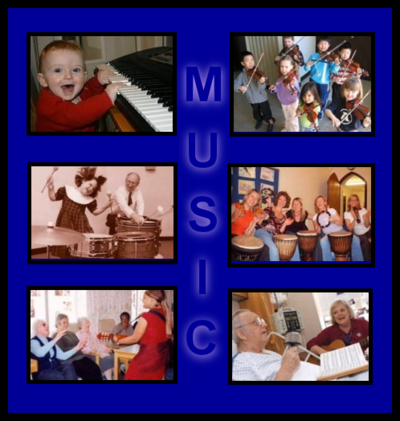 In time, Mom developed Post Infarct Dementia…which is dementia from a stroke. As the years progressively took her memory as well as the strength in her body, it became apparent that she could no longer go outside to her beloved Lilacs and bring cuttings inside to enjoy their beautiful scent. So when the Lilacs were at their most fragrant, Dad would bring some of the flowers into their home. Oh how the air was filled with their amazing perfume and even in her dementia, Mom’s reaction was priceless! Dad appreciated the beauty of flowers but he wasn’t really one to go out and buy them on a regular basis. I smile in remembrance of this! Now there was no thought as to what flowers I would put in her vase at the cemetery that year. Because of his loving devotion to Mom, Dad held strong through her years of need but now he appeared to be surrendering to his own needs. He followed her ‘Home’ that next year. 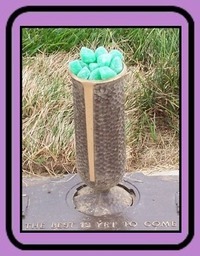 While visiting their gravesite on Father’s Day, I decided to place some ‘Greensleeves’ in his vase instead of flowers. I stood there and could not help but giggle as to what the groundskeeper might say when it was time for him to mow the lawn that next week!! Ok…I didn’t just giggle, I laughed! I laughed good and long and hard and the feeling was like a healing balm that soothed my tired body, mind and soul. Oh how I needed that!! To this day I sometimes wonder if the groundskeeper ever took a ‘Greensleeves’ or two out of the vase that week. Knowing my Dad as a person who shared with others, I think he would have liked that! Even after 40 years of nursing in other areas of practice, what I’ve learned about caregiving in the home, I learned from my walk with my parents during this needful time in their lives. As a caregiver, I truly understand the emotions, the hard work involved, the long hours worked each day and sometimes into the night. I understand the feelings that those being cared for have and how difficult it can be for them at this time in their lives when they want their ‘Golden Years’ to be just that….Golden. To those of you who are being cared for, to those who are family and friends or who are the caregivers themselves, Care4You recognizes the need for you to be respected, validated and to be heard. Our professionalism, drive, caring spirits, our desire to help our clients stay as independent in their homes for as long as possible…these are some of the many attributes that we all share with Donna Hoover! Everyone has someone in their lives at one time or another who are their…..